Automatic foam dispensing is redefined by combining the highest capacity system of its size with world-class reliability and environmental savings! Patented Smart Sensor and Dry Cam Gear technology in AutoFoam Soap Systems deliver a concentrated dose of enriched foam to provide the most hand washes - up to 38% more than similar foam systems. Energy efficient technology ensures an industry-leading battery life of 120,000 doses or 3 years. Plus, boxless refills reduce packaging waste for maximum environmental savings - up to 80% vs. traditional bag-in-box refills. Aesthetically superior design enhances decor. A superior hand washing experience. 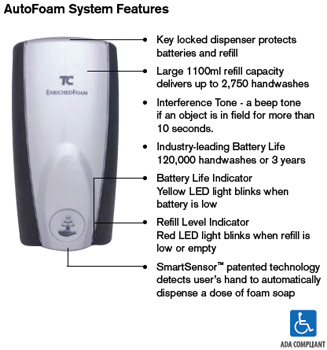 Touch-Free dispensing encourages healthy hand washing. Lower Cost-In-Use than other competitive products. Environmentally superior system to bag-in-box refills.